The Choice on the Street is TCI Transmissions! TCI Streetfighter Transmissions are ideal for vehicles powered by non-supercharged engines producing 400 to 775 horsepower, using pump gasoline. 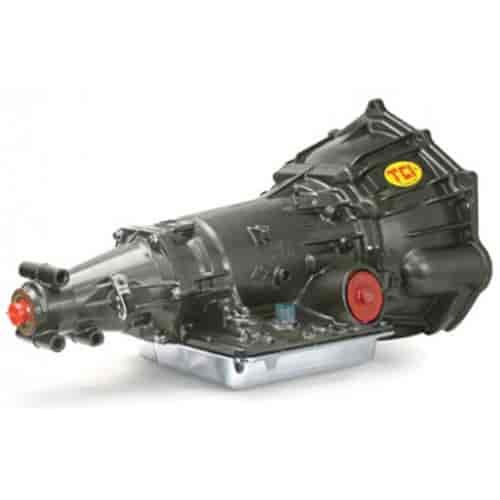 Equipped with a TCI manual/automatic valve body, the StreetFighter Transmission allows you to shift manually into each gear or to remain fully automatic by placing it in Drive. The valve body, however, permits downshifting if the engine speed is lowered to the low gear operating range. To function properly, all throttle linkage, vacuum lines, and kickdown components must be connected. TCI's high standards ensure that you can expect dependable and long-term performance. Does TCI 371004 fit your vehicle?